The Life Cycle Initiative is a public-private, multi-stakeholder partnership enabling the global use of credible life cycle knowledge by private and public decision makers. Hosted by UN Environment, the Life Cycle Initiative is at the interface between users and experts of Life Cycle approaches. It provides a global forum to ensure a science-based, consensus-building process to support decisions and policies towards the shared vision of sustainability as a public good. It delivers authoritative opinion on sound tools and approaches by engaging its multi-stakeholder partnership (including governments, businesses, scientific and civil society organizations). The Initiative facilitates the application of life cycle knowledge in the global sustainable development agenda in order to achieve global goals faster and more efficiently. 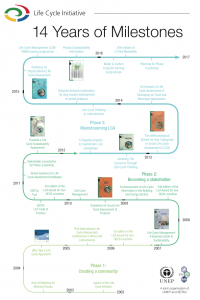 The strategy was developed by the Life Cycle Initiative Strategy Working Group with the Initiative Secretariat, and has been commented by the International Life Cycle Board at the end of its phase 3. It has been approved by the new Steering Committee in October 2017. The annexes describe the relevance, ethics, governance, rules and responsibilities shaping the 2017-2022 strategy. This interactive image traces major events and publications that have been produced throughout the lifespan of the Initiative, since its inception in 2002. Click through and trace the evolution of the Initiative, as well as the evolution of Life Cycle Thinking. An interactive poster portraying a selection of outputs and milestones since the establishment of the Life Cycle Initiative in 2002. Click to access the interactive version.